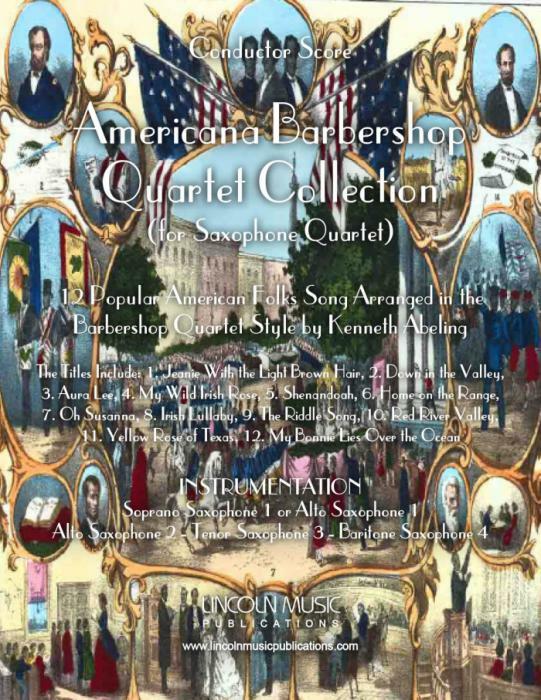 This is a collection of 12 popular American Folk Songs dating from the Mid-1800’s to the early 1900’s arranged in the Barbershop Quartet style for Saxophone Quartet by Kenneth Abeling. The titles include: 1. Jeanie With the Light Brown Hair, 2. Down in the Valley, 3. Aura Lee, 4. My Wild Irish Rose, 5. Shenandoah, 6. Home on the Range, 7. Oh Susanna, 8. Irish Lullaby, 9. The Riddle Song, 10. Red River Valley, 11. Yellow Rose of Texas, 12. My Bonnie Lies Over the Ocean. This is an intermediate level arrangement with numerous performance applications for both the amateur and professional ensemble. The approximate playing time of the entire collection with repeats is 16:15, and 9:10 without repeats.